In this cloud business modernization session we will discuss the reasons the Fortune 1000 Line of Business are moving traditional on-premise data warehouses to AWS Amazon Redshift and discuss the best practices Cloudwick has learned from more than 100 enterprise engagements. 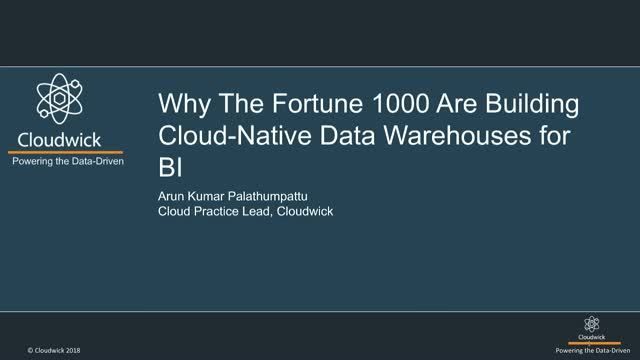 This session will provide you with a clear roadmap for planning, building and operating a cloud data warehouse for modern business intelligence. •How analytics runs faster on Amazon Redshift? •How to get started with cloud native data warehousing journey? Using AWS for advanced analytics and machine learning is an increasingly difficult and costly challenge for all organizations. All the while, business and data science users need access to more data, analytics and machine learning tools. Engineering and IT are looking for managed solutions that can run on their AWS infrastructure or delivered as a SaaS. -How business and data science users can do more with their data on AWS? -How engineering and IT can manage their AWS infrastructure in a scalable cost-effective manner? -How easy to orchestrate data driven pipelines on AWS? This webinar introduces Amorphic Data, the first self service AWS analytics and machine learning orchestration platform that simplifies cloud analytics and machine learning for all business, data science and engineering users. Data Lakes have become strategic to the adoption of modern analytics in many enterprises over the past couple of years, and lines of business require faster and more flexible access to corporate and external data sources, and build business value through modern analytics and machine learning. Please join us for a webinar where Cloudwick is bringing together the leading Enterprise Cloud first ISV's; ETL with Matillion for Snowflake, Snowflake for Data Warehouse and Looker for Modern Analytics on Amazon Web Services Platform. Customers can take advantage from a turnkey four week Proof of Concept (POC) engineered to provide an enterprise Line of Business (LoB) use case with a modern data warehouse and data analytics capability with our premiere partners: Matillion ETL for Snowflake, Snowflake for Data Warehouse, and Looker for Data Analytics on AWS. *Please ask about POC discount incentive and an additional funding from AWS for eligibility and approval by partners. ✔ Best practices for your AWS data lake. ✔ Enterprise case studies – what works and doesn’t work. Mark Schreiber is the General Manager of Cloudwick where he leads its ADL, Amazon Data Lake, business. Cloudwick is a certified AWS, Cloudera, Hortonworks, DataStax, Databricks, Mesosphere, Tableau, H2O.ai Partner with more 150 big data, cloud and advanced analytic consultants working to modernize digital business for global enterprises. Prior to Cloudwick, Mark held management positions at Wipro, HP and Cisco. An introduction to CDL, the world's first managed on-premise and cloud cybersecurity data lake. Developed with Intel and leading data center, cloud and security vendors, CDL is designed to democratize security analytics at scale, unlock the potential of today’s siloed security solutions, and provide a converged security analytic platform for enhancing and extending SIEM, EDR, IDS/IPS and other traditional systems as well as powering User and Entity Behavior Analytics (UEBA), Machine Learning (ML), Advanced Analytics (AA) and Artificial Intelligence (AI) solutions. CDL enables enterprises to win the war against today’s top digital business threats including malware, ransomware, Advanced Persistent Threats (APT), Data Leak Protection (DLP), insider threats, denial of service, botnets and nation state attacks. Learn how CDL Enhances, Extends & Enables new capabilities for your SIEM, EDR, IDS, IPS, NTA, EUBA and ML solutions at scale. The Data Lake Channel covers all things data lake, including Cloudwick's: Amazon Data Lake (ADL), Cybersecurity Data Lake (CDL), and On-Premises Data Lake (ODL) SaaS solutions and services.